2008 Bowman Chrome Baseball doesn't represent the best of the brand. A weak rookie and prospect checklist leave this set overlooked among many collectors. The base set has 220 cards. 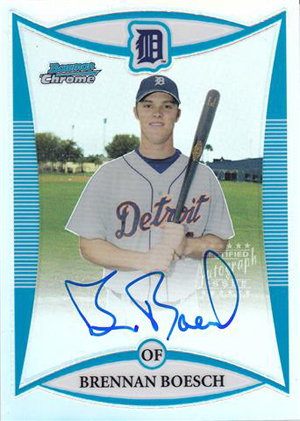 Several players in 2008 Bowman Chrome Baseball have designated rookie cards, although they have prospect cards from earlier that are more highly sought after. Evan Longoria falls into this category. 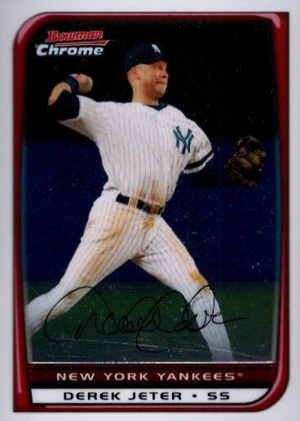 His 2006 Bowman Chrome Draft Autograph commands a lot more attention than his official 2008 Bowman Chrome rookie card. Longoria is the only rookie card that really stands out in 2008 Bowman Chrome Baseball. Second-tier rookie cards include Justin Masterson, Johnny Cueto and Kosuke Fukudome. The big draw in with the Bowman brand are the prospect cards that often mark the first cardboard appearances of players in a Major League uniform. Numbered outside of the base set, they are technically inserts. However, many collectors treat them as they would rookie cards. Particularly popular are the autographs. With 45 different signatures in the set and just one per box, individual cards can be relatively tough to come by. 2008 Bowman Chrome doesn't have a deep autograph checklist, especially when you compare it to the very strong 2008 Bowman Draft checklist. Top choices are limited to the likes of Brennan Boesch, Jordan Schafer and Daniel Bard. Like other Bowman and Bowman Chrome sets, the various levels of Refractors are popular among prospectors and player collectors. Available for both base cards and prospects, there are seven levels of Refractors, most of which are numbered, plus Printing Plates. Other than Refractors, the only other insert set is Head of the Class. The checklist for the dual autographs has just three cards. Numbered to 350, each also has three different Refractor parallels. Hobby boxes come with 18 packs of four cards. Each box guarantees one autograph and six Refractors. Cards inserted two per pack. Checklist continues on from 2008 Bowman Baseball. Autographs (#241-285) inserted 1:18 packs. 2008 Bowman Chrome Prospects #DCP124 Jarrod Parker Auto 10 BGS 9 Rookie RC HOT! Jed Lowrie 2008 Bowman Chrome BLUE REFRACTOR SP Rookie RC #193 A's 014 150 HOT! !